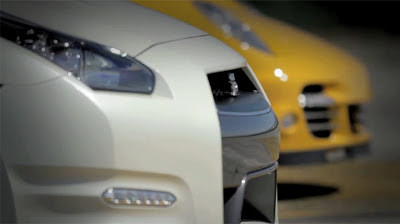 Since the dawn of it's creation the Nissan GTR has had one primary goal - Be faster than the Porsche! These two legendary cars have been pitted against each other time and time again. We've all done it - watched the 911 battle the GTR in Wangan Midnight (full movie link), read about it countless times in car magazines, watched all the YouTube videos possible to try and determine which one is the better car. No, not just the better car, but which one will I enjoy more - and sadly for the great lot of us - which one is actually worth my money - since it's likely we aren't buying two super cars in the same week now are we. Edmunds Inside Line favors the GTR for the money, saying it's an all-around better car. While Jalopnik comments that they tend to lean more towards the Porsche for their own reasons, even though the discussion thread of users tends to suggest a more argumentative reasoning. Finally, the boys over at Top Gear [UK] make the argument that they love the GTR for it's aggression but favor the Porsche for its comfort designs, which again is strange considering so many others find the opposite to be true in fact. Well, if we take some particular examples it may help to see what's really going on here. Motortrend put together a great video clip (above) from their article comparing the Porsche 911 against the Nissan GTR. I've summarized some of their findings in the table below. OK, so it's pretty clear what the main differences are; like how the Porsche 911 has better straight-line acceleration, or that the GTR feels more like a super-car because it can get a lot angrier and comes in many thousands of dollars cheaper. But when it comes down to pricing we can't really judge based on MSRP alone - Let's look to the real market prices and see a few examples of what these bad boys are going for dollar wise. Checking out the prices for a Porsche 911 we can see some great examples; For anything newer than a 2008 the best price you'll find is North of $177,000. Let's take things up a notch, now we consider 2 examples - one GTR and one Porsche. But these aren't your ordinary super-cars, these have been built to massive power and are put to the test in Russia's Unlim 500+ Drag Racing Series. In the clip above a Nissan GT-R AMS Alpha 12 goes head up against a Porsche 911 Turbo Proto R911 - not exactly the standard options we've been considering previously but none the less this does give a fantastic idea of what's capable at monster power levels. The table below summarizes the conclusions of this race. So all in all, what can be said about this comparison besides the fact that it's been done to death?